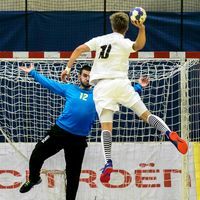 The opening two days of the Men’s 18 EHF Championship event in Tulln, Austria, have already seen a bunch of teams emerge as genuine contenders for the title. Montenegro lead Group A after two contrasting victories. They were pushed in the second half by Great Britain in a 25:20 win, before a 49:8 win over Ireland, who have a majority of players still one age group younger than 18 and have been given a rough welcome to this level of competition. Czech Republic have also been in flying form, backing a solid opening win against Ukraine with a 33:12 triumph over Great Britain. In Group B, hosts Austria have run riot with two victories by a combined margin of 50 goals.